When I wrote about the plague less than two weeks ago, I cited a source that said there were 200 infections and 33 deaths. As of today, those numbers have increased dramatically to more than 1300 infections and 124 deaths. And according to many infectious disease experts, the outbreak has not yet reached its peak. It’s urgent that we stay up-to-date on this epidemic so that we can be prepared if it goes worldwide. Normally, Madagascar has about 400 cases of plague per year. But this year, it’s worse because it is the pneumonic plague. It gets into the victim’s lungs and is passed through the air from coughing. It’s the most deadly form of a horrific disease, often killing the victim within 24 hours. 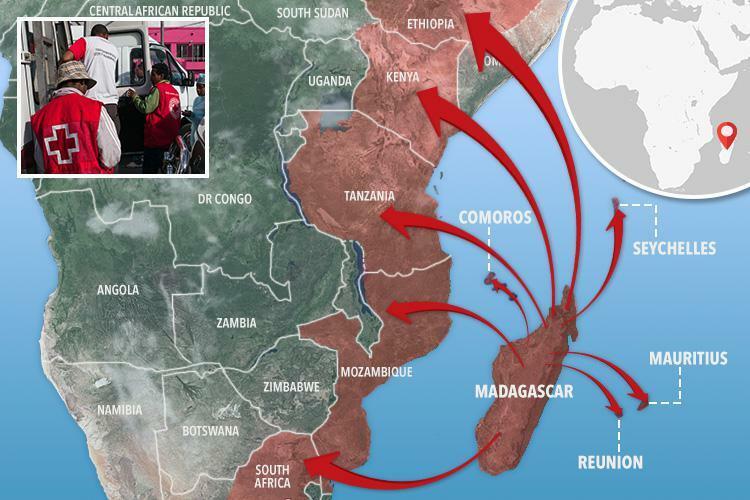 Madagascar is a highly populated island with more than 25 million people, and this outbreak has hit the capital city, with more than a million people crammed into an urban environment. There are no real travel restrictions, so flights are going in and out of the international airport, and cargo is still being shipped. Even worse, the funeral customs in Madagascar have people parading corpses down the street and literally dancing around them. Nine countries and overseas territories have been identified as priority countries in the African region for plague preparedness and readiness by virtue of having trade and travel links to Madagascar. WHO is prepositioning equipment and supplies, including personal protective equipment, antibiotics and other equipment required to safely identify plague cases, in Comoros, Mauritius, Mozambique, Seychelles, and Tanzania. The risk of regional spread is moderate due to the occurrence of frequent travel by air and sea to neighbouring Indian Ocean islands and other southern and east African countries. Some of those locations are holiday hotspots and people would be well-advised to consider other vacation plans. What are the facts about the pneumonic plague? The most apparent symptom of pneumonic plague is coughing up blood. Other symptoms are fever, headache, shortness of breath, chest pain, cough, and sometimes bloody or watery mucous. Without treatment, the victim will most certainly die. Pneumonic plague can be treated with antibiotics like streptomycin, gentamicin, tetracyclines, or chloramphenicol but there is a caveat. Treatment MUST begin within 24 hours of the initial symptoms to prevent death. If a person has been exposed to plague, a prophylactic treatment of 7 days of antibiotics can prevent them from becoming ill. Using a close-fitting surgical mask can protect people from contracting plague. This is the same version of plague known as The Black Death that wiped out a third of the population of Europe during the Middle Ages. With proper intervention, it is unlikely to exact a similar death toll today, but it is still an incredibly dangerous threat. How do you get prepared for a pneumonic plague pandemic? First, let me be absolutely clear that at this time, the United States has no cases of plague, nor are Americans at extreme risk. There are no cases of pneumonic plague reported outside Madagascar. However, there are no travel restrictions. Planes and boats are coming and going from the country, so it’s essential to be alert and to watch this carefully. After all, scientists have just warned the world how unprepared we are for a pandemic. Please remember the almost-catastrophic Ebola pandemic of 2014. It’s essential to prepare for a pandemic well before it ever hits our country because once it arrives, you won’t be able to get the supplies you need in the panic buying frenzy. *Article originally appeared at The Organic Prepper.